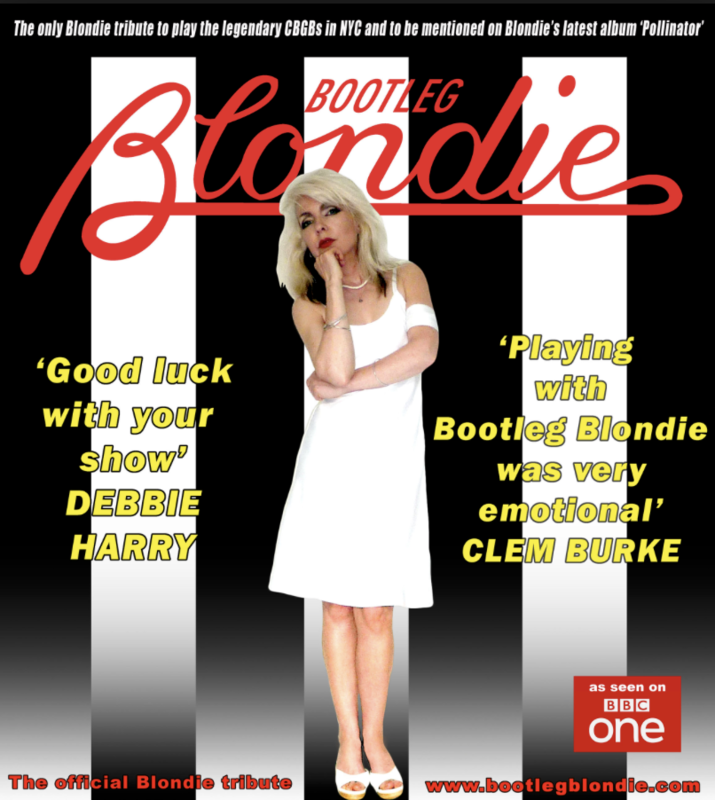 Bootleg Blondie With Clem Burke Play Backstage at the Green Hotel Kinross on Wednesday 30th & Thursday 31st January 2019 at 8.00pm for EMS /Mundell Music. Tickets £28. Buy Wednesday Tickets HERE. Tickets £28. Buy Thursday Tickets HERE. Parallel Lines is the third studio album by the American rock band Blondie. It was released in September 1978 by Chrysalis Records to international commercial success. The album reached No. 1 in the United Kingdom in February 1979 and proved to be the band’s commercial breakthrough in the United States, where it reached No. 6 in April 1979. In Billboard magazine, Parallel Lines was listed at No. 9 in the top pop albums year-end chart of 1979. As of 2008, the album had sold over 20 million copies worldwide. The album spawned several successful singles, notably the international hit “Heart of Glass”. Blondie Drummer Clem Burke Goes Deep into the Inspiration for ‘Heart of Glass’, ‘Rapture’ and More When you’re one of Rolling Stone’s “100 Greatest Drummers of All Time” and you’ve played for a wow-factor list of other artists, you are the drummer for Blondie, an ideal subject for an upcoming documentary on Sky. Also affectionately known as the Doctor of Rock, and as the hardest-working drummer in the business, Clem Burke takes none of it for granted. He understands that Blondie’s selling of more than 45 million albums is no accident. Burke has been a part of the legend since 1975, someone who’s been referred to more than once as the “backbone” of the band’s sound. His peers revere his creativity, stamina and raw talent well honed through the decades, and showing no signs of abating. BOOTLEG BLONDIE is the official Debbie Harry & Blondie tribute band, the only Blondie tribute to play the legendary CBGB’s in New York City before it’s demise in 2006 and to have the honour to be thanked on Blondie’s 11th album ‘Pollinator’. Lead vocalist Debbie Harris appeared on two shows for BBC1 when she was picked out of 15,000 applicants to represent Debbie Harry on ‘Even Better Than The Real Thing’ hosted by Paddy McGuinness which attracted an audience of 10 million viewers! Debbie Harris is the niece of Shani Wallis who played Nancy in Lionel Bart’s musical Oliver. Debbie and Andy have met Blondie many times and have even had Clem Burke play drums on stage with them. We all enjoyed it so much we wanted more! 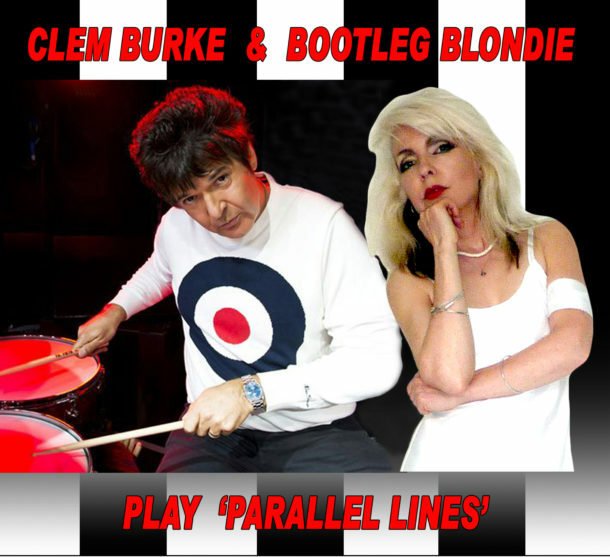 And so to celebrate 40 years since the release of Blondie’s iconic album Parallel Lines, we have put together this tour with Clem Burke and Bootleg Blondie! ONE WAY OR ANOTHER WE’RE GONNA GETCHA GETCHA GETCHA! In May 2017 Bootleg Blondie had the unbelievable honour of being mentioned on Blondie’s acclaimed 11th studio album ‘Pollinator’. Probably a first for any tribute band! Debbie Harris, as seen on BBC1, is the niece of the celebrated singer and actress Shani Walliswho played Nancy in Lionel Bart’s musical film ‘Oliver’!